A nice-paced mid-week long run and some hill repeats with Aaron Heath on Saturday made for a 90-mile week. Badwater is the only “A” race of the year, and that means that there are some decisions to be made about Umstead 100 (March 31) – (a) run the 100 mile with a target of 24 hours; (b) run the 100 mile with a target of 21 hours or faster; (c) run the 50 mile option; or (d) do not run at all. There is likely plenty of value in each of those options. Any suggestions? 3:15 PM – 4.00 miles in 40:00 (10:00 pace) as .25 mile repeats during 1 hour and 15 minute strength training session. 3:00 PM – 3.00 miles in 30:00 (10:00 pace) as .25 mile repeats during a 1 hour and 15 minute strength training session. 6:13 AM – 24.80 miles in 4:02:49 (9:47 pace) at Bear Mountain - Perkins Drive. Hill repeats of approximately 4.20 miles (3 total up and down) with about 3,600 feet of elevation gain. 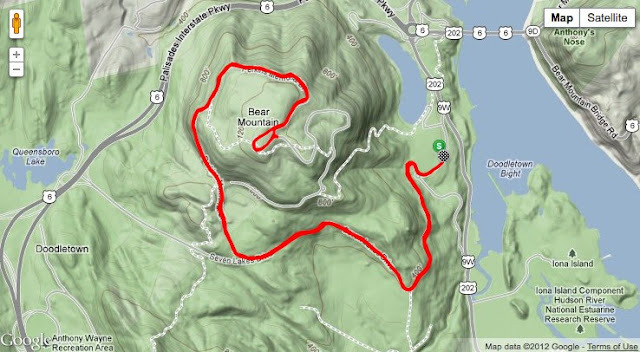 Going from the parking lot at Bear Mountain to the top of Perkins Drive covers about 1,200 feet of elevation gain on all roads. It is steep and steeper at certain points. Running with Aaron Heath was a crazy idea, but he kept me moving as we ran the entire first 2 repeats together, and 2 miles of the third one. It was then, for the last 2 miles uphill, feeling depleted, that I threw in a bit of power walking. I uploaded the data to Strava, a site that was recently recommended to me by a friend. It is pretty cool and provides interesting analysis of GPS recorded runs and cycling. It even purports to give you "GAP" - grade adjusted pace - that takes into account the % grade to determine what your pace would have been on a flat surface (see chart below). 6:41 AM – 13.10 miles in 2:03:17 (9:24 pace) at Rockefeller State Park. The legs were tired and heavy from yesterday’s hill workout. im voting 50miles with the reason being you are going to run it as a long training day, training up to and thru it. running close to 50miles during the week and finishing up the week with the 50m option to get a 100m week. Go for PR. No questions.